Every city is proud of its local food scene, and Dubai is certainly no exception. This emirate is home to hundreds of different restaurants and cuisines and is slowly but surely earning a great reputation among serious foodies. Even just by reading the latest Dubai restaurant reviews, you can get a clear idea of how expansive and impressive Dubai’s culinary scene has become. With hundreds of dining establishments and cuisines available in Dubai, choosing which kinds of food to eat here can be quite an ordeal. But if you’re only in the city for a temporary spell, it would be best to indulge in some traditional, authentic Arabic dishes first. Foul medames is a traditional Arabic breakfast dish originally from Egypt that is popular in Dubai and around the Middle East. The dish consists of fava beans boiled in lemon juice, olive oil, and garlic, and mashed once they become tender. The mashed beans are served with pita bread and some vegetables. If you’re looking for an Arabic dish that you’re familiar with, you won’t go wrong with ordering shawarma. This is an Arabic food that you may already know since you can order this dish nearly anywhere in the world today. In Dubai, you can choose from chicken, beef or lamb shawarmas. Slices of pickles and tomatoes and a drizzle of garlic sauce will accompany your choice of meat. Some local restaurants now serve this dish with a special banana and strawberry fruit shake so that you can enjoy a complete meal. Once you’re ready to venture into more unfamiliar ground, start by trying khuzi or ghuzi, the UAE’s national dish. Roasted lamb or mutton is served on top of a bed of spiced rice. To make the dish more flavorful, vegetables and nuts are also added. Many restaurants in Dubai serve authentic versions of this dish in single or to-share portions so you can enjoy the complete meal either by yourself or with your fellow travelers. This traditional Emirati dish consists of boiled wheat with salt and tender, flavorful chunks of lamb, mutton, chicken or veal. This one-pot dish is cooked for hours to ensure that the wheat gains a coherent smoothness of texture and taste. The meat and other spices are later added to boost the flavor of the dish. It is a tasty, hearty dish that will help you discover what traditional Emirati food is all about. Another popular Arabic dish, Thereed is a rich and hearty stew. In the UAE, the stew is typically made with succulent meat and roasted vegetables such as potatoes, pumpkin and tomatoes and slow-cooked for hours. The stew is served on a traditional Emirati flatbread called rigag and is quickly and wonderfully transformed into a complete, filling and flavorful meal. 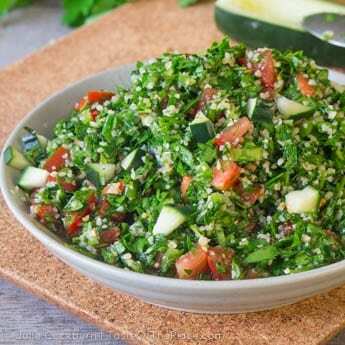 If you’re looking for authentic Arabic vegetarian fare, a dish of tabouleh will satisfy your palate. It is a type of vegetable salad with cracked wheat or bulgur wheat, mint and parsley. You can order it as an appetizer or even as your main meal. After having your fill of savory and vegetarian dishes, move on to some sweet ones. Start with some luqaimats – golden puffs of deep-fried dough covered with date syrup. It is a traditional Emirati dessert that is both sweet and savory at the same time. Another popular sweet dish that you should try is mehalabiya, a traditional Arabic rice pudding. 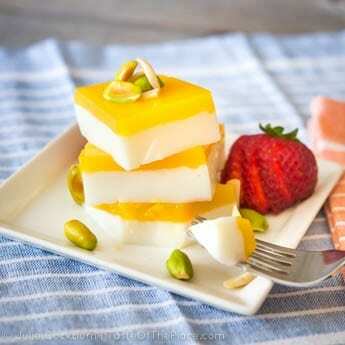 It is flavored with rosewater and topped with pistachios and, as such, is one of the most fragrant and delicious desserts you should enjoy in Dubai. 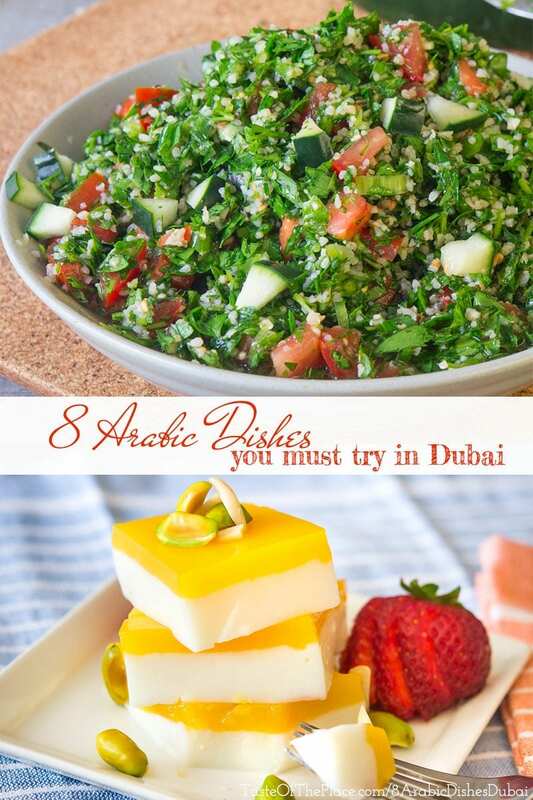 To be certain that you will enjoy traditional Arabic dishes (and not some poor versions), check the list of the best Dubai restaurants that have excellent reviews. Once you’ve made your choice, don’t be afraid to try something new and different, so that you can truly experience everything that Dubai’s food scene has to offer. Kumar Samtani is the co-founder of MenuPages.ae. With an educational background in Industrial & Operations Engineering from the prestigious University of Michigan, Ann Arbor, Kumar’s expertise lies in process improvement & operations management for all types of organizations. He is also an experienced entrepreneur with business interests in consumer goods, hospitality supplies & real estate. Share this yumminess, and make the world a tastier place! 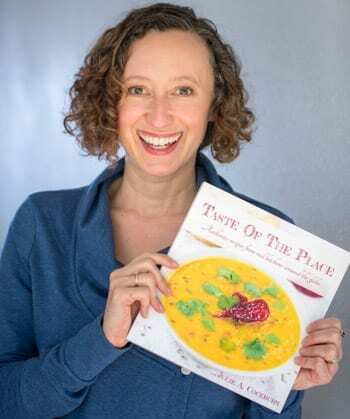 The Taste Of The Place cookbook has arrived! Get 20% off + a FREE chapter from my new cookbook! And get my newsletter, filled with tasty recipes, delivered straight to your inbox. Opt-in to receive news and updates. Be sure to check your inbox for a confirmation email from me. 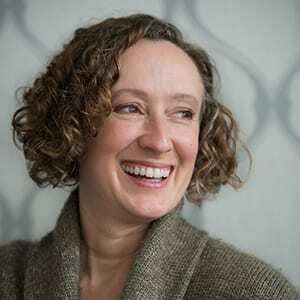 My name is Julie, and this is where I share my love of all things regional food and culinary travel. You’ll find lots of delicious & approachable recipes from around the world, with a focus on real, whole food ingredients & authentic flavors, plus tasty cultural tidbits & even the occasional culinary travel tip. I am a participant in the Amazon Services LLC Associates Program, an affiliate advertising program designed to provide a means for me and Taste Of The Place to earn fees by linking to Amazon.com and affiliated sites.